Polychlorinated biphenyls are persistent organic pollutants that can be metabolized via hydroxylated PCBs to PCB sulfate metabolites. The sensitive and selective analysis of PCB sulfate monoesters by gas chromatography-mass spectrometry (GC-MS) requires their derivatization, for example, as PCB 2,2,2-trichloroethyl (TCE) sulfate monoesters. To aid in the identification of unknown PCB sulfate metabolites isolated from biological samples, the electron impact MS fragmentation pathways of selected PCB TCE sulfate diesters were analyzed and compared to the fragmentation pathways of the corresponding methoxylated PCBs. The most abundant and characteristic fragment ions of PCB TCE sulfate diesters were formed by releasing CHCCl3, SO3, HCl2 and/or CCl3 from the TCE sulfate moiety and Cl2, HCl, ethyne and chloroethyne from an intermediate phenylcyclopentadienyl cation. The fragmentation pattern depended on the degree of chlorination and the position of the TCE sulfate moiety (i.e., ortho vs. meta/para to the second phenyl ring), but were independent of the chlorine substitution pattern. These fragmentation pathways are similar to the fragmentation pathways of structurally related methoxylated PCBs. Knowledge of the fragmentation patterns of PCB TCE sulfate diesters will greatly aid in determining the position of sulfate moiety (ortho vs. meta/para) of unknown PCB sulfate metabolites isolated from environmental or laboratory samples. Polychlorinated biphenyls (PCBs) are a family of manmade chemicals that were sold commercially from the 1920s to the 1970s as stabilizing additives in flexible PVC coatings of electrical wiring and in electronic components, cutting oils, flame retardants, hydraulic fluids, sealants, and adhesives [1, 2]. They are still used as dielectric fluids in transformers and capacitors in the United States. Their large scale use and their physicochemical properties, such as semi-volatility and stability toward biological, chemical and thermal degradation, have resulted in worldwide environmental contamination [1, 2]. Since the first identification of PCBs in human and wildlife samples in 1966  the study of PCBs' adverse effects on human health and the environment has received significant attention [1, 2, 4, 5]. Laboratory and epidemiological studies have implicated PCBs in a broad range of adverse biological effects, including (neuro-) developmental toxicity  and carcinogenesis . PCBs are metabolized by cytochrome P450 (CYP) isoforms, such as CYP2B and CYP1A, to hydroxylated derivatives (HO-PCBs) . HO-PCBs may be further metabolized by phase II enzymes to PCB sulfates [7, 8]. Aside from serving as substrates, certain HO-PCBs are inhibitors of sulfotransferases [8–10]. Unfortunately, the role of PCB sulfate metabolites in the disposition and toxicity of PCBs is poorly understood. Therefore, it is necessary to identify and quantify the PCB sulfate conjugates with the help of modern scientific methods, such as mass spectrometry. There are several kinds of ionization methods that can be used in mass spectrometry studies of PCB sulfates, such as electrospray ionization (ESI), matrix assisted laser desorption ionization (MALDI), chemical ionization (CI), atmospheric pressure chemical ionization (APCI), or electron impact (EI). However, it is difficult to identify PCB sulfate conjugates by mass spectrometry directly due to their amphiphilic and non-volatile character, and the fragility of the sulfate moiety under typical mass spectrometric conditions. Fortunately, electron impact mass spectrometry, by which abundant fragment ions can be obtained, is a useful and straightforward method to identify the (poly)aryl compounds [11–16]. Paulson and co-workers have reported a gas chromatography-mass spectrometry (GC-MS)-based characterization method that converts the sulfate monoester into the corresponding aryl alkyl sulfate diesters, which are stable under temperature programmed GC conditions . Building on this approach, we have explored the utility of 2,2,2-trichloroethyl (TCE)-protected PCB sulfates as potential derivatives for the qualitative and quantitative analysis of PCB sulfate metabolites. Here we report the EI-MS fragmentation mechanism of selected PCB TCE sulfate diesters. The PCB 2,2,2-trichloroethyl sulfate diesters 1–10 and selected, structurally-related methoxylated PCBs 11 and 12(Figure 1) were analyzed by electron ionization mass spectrometry (EI-MS). 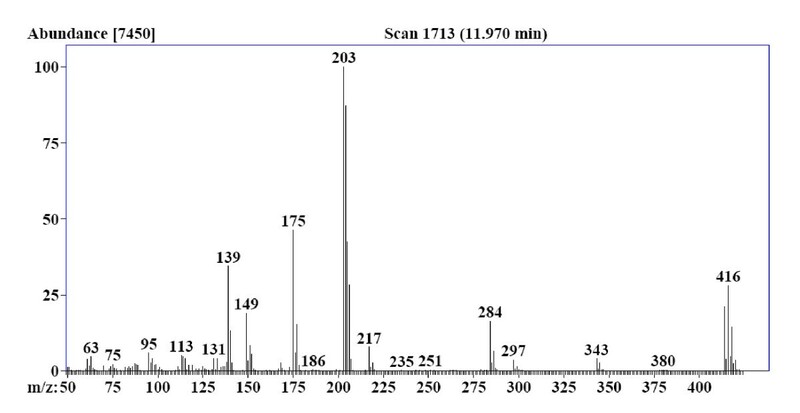 Representative EI-MS spectra are shown in Figures 2, 3, 4 and 5. The MS fragment ions and the corresponding relative abundance are given in Table 1. To simplify the discussion, only 35Cl peaks are discussed for fragment ions with isotopic chlorine atom(s) . The MS fragmentation pathways of compounds 5 and 8 were investigated as typical examples of the fragmentation of TCE PCB sulfate diesters. In addition, the effects of the degree of chlorination and also the chlorine and "OR" substitution patterns (-OR = -OMe or -OSO3TCE) on the MS fragmentation pathways are discussed. Here we will first discuss the loss of the TCE-sulfate moiety from the parent ion to form (chlorinated) phenylcyclopentadienyl cations and then the fragmentation pathways of (chlorinated) phenylcyclopentadienyl cations. Structure of the PCB sulfates and the corresponding methoxylated PCBs. EI mass spectrum of compound 5. 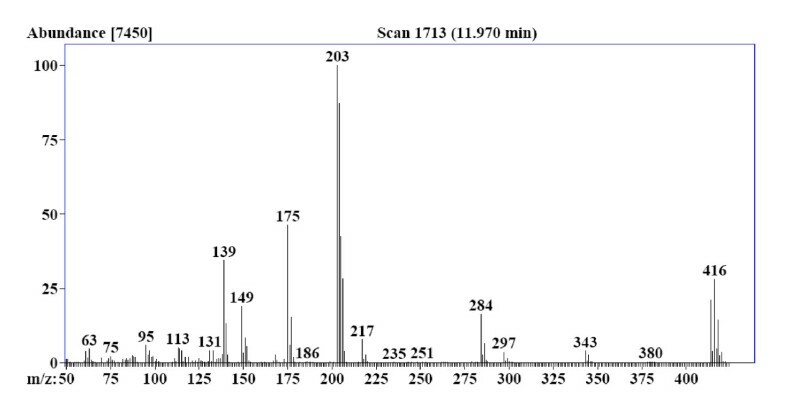 EI Mass spectrum of compound 2. 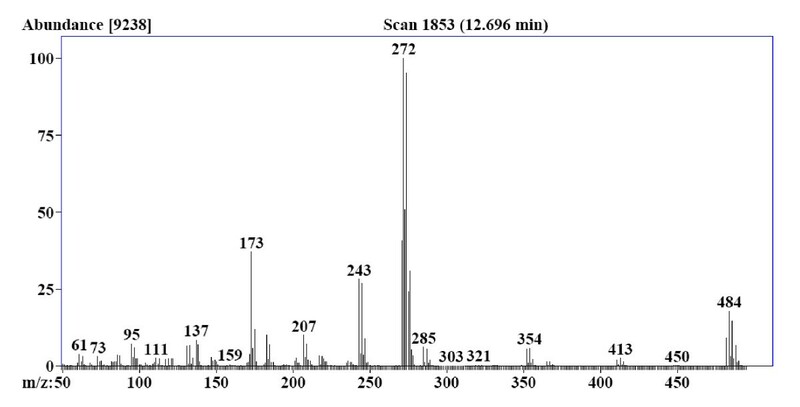 EI mass spectrum of compound 3. EI mass spectrum of compound 8. EI-MS data of PCB sulfates and methoxylated PCBs obtained from GC-MS. Note: The relative abundance of fragment ions:# [M-HCl2]+; * [M-CCl3]+; $ [ArOSO3H]+. 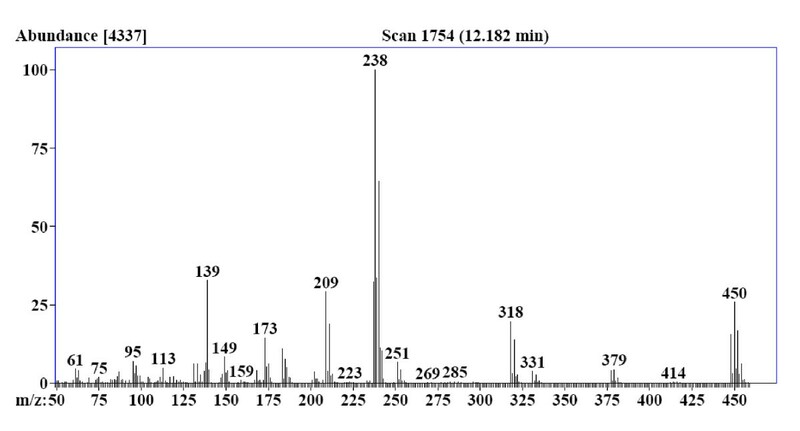 The mass spectrum of compound 5 displays its molecular ion 5a with the typical isotope pattern  of a pentachlorinated compound at m/z 448 (relative abundance, 15%) (Figure 2). Scheme 1 illustrates the various fragmentation pathways of this precursor ion. The molecular ion 5a loses a PCB sulfate (ArOSO3-) group, thus yielding TCE group-derived fragment ions. These ions, [CH2CCl3]+ and [CH = CCl2]+, are observed at m/z 131 (6%) and 95 (7%), respectively. 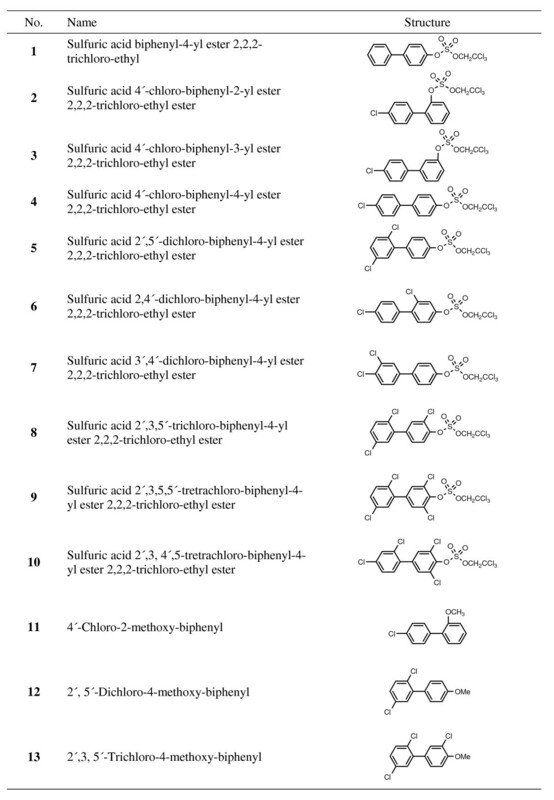 Principal EI-MS fragmentation pathways of sulfuric acid 2',5'-dichlorobiphenyl-4yl ester 2,2,2-trichloroethyl ester 5. More complex fragmentation patterns are observed for the fragmentation of the -OSO3-TCE group. The abundant fragment ion 5g (m/z 237, 28%) can be formed by two fragmentation pathways from precursor ion 5a. One pathway involves the release of HCl and Cl from precursor ion 5a, leading to an unstable cyclic fragment ion 5b (m/z 377, 5%). In turn, fragment ion 5b produces the fragment ion 5g after releasing chloroethyne and SO3. The other pathway resulting in the formation of fragment ion 5g involves the removal of two neutral molecules, HCHO and SO2, from the daughter fragment ion 5c (m/z 331, 5%), which is formed by releasing the free radical group CCl3 from fragment ion 5a. Alternatively, the fragment ion 5c can also produce the daughter fragment ion 5e (m/z 183, 12%) by losing one molecule of SO3. In addition, precursor ion 5a yields the daughter ion 5d by losing a CHCCl3 fragment. The basic fragment ion 5f at m/z 238 is produced from the daughter ion 5d (m/z 318, 20%) by releasing one molecule of SO3. Fragment ions 5f and 5g can produce the important fragment ion 5h at m/z 209 with a relative abundance of 26% by losing a CHO or CO fragment, respectively. The same fragmentation pathways are observed for the TCE PCB sulfates diesters 1 and 3–10. The only exception is compound 2, which has the TCE sulfate group in ortho position to the other phenyl ring. The mass spectrum of compounds 2 is distinctively different from the mass spectrum of its isomer, compound 3 (Figures 3 and 4). As shown in Scheme 2, the basic fragment ion of compound 2 is the stable dibenzofuran ion 2f. Fragment ion 2f is formed from the parent ion 2a (m/z 414; relative abundance, 21%) by sequential loss of CHCCl3 (2d, m/z 284; relative abundance, 10%), SO3 (2e, m/z 204; relative abundance, 28%) and HCl (2f, m/z 168; relative abundance, 100%). The stable dibenzofuran cation 2f is also formed as the base peak ion in the fragmentation pathways of corresponding methoxylated PCB 11 (Table 1). Similarly, other 2-methoxy PCB derivatives also form a stable dibenzofuran cation after losing chlorine atom and methyl group . Principal EI-MS fragmentation pathways of sulfuric acid 4'-dichlorobiphenyl-2-yl ester 2,2,2-trichloroethyl ester 2. The relative abundance of several fragment ions depends on the position of the -OSO3-TCE group and the chlorine substitution pattern. The relative abundance of the [M-HCl2]+ and [M-CCl3]+ fragment ions of compound 2, 9 and 10 are lower compared to all other TCE PCB sulfate diesters (Table 1). This lower relative abundance is due to steric and/or electronic effects resulting from the ortho phenyl substituent in compound 2 or the two ortho chlorine substituents in compounds 9 and 10. In addition, the relative abundance of fragment ion [ArOSO3H]+ of the TCE PCB sulfate diesters 9 and 10 is low compared to the corresponding fragment ion of the other TCE PCB sulfate diesters, with only a trace of the respective ions being observed (Table 1). For example, the relative abundance of [ArOSO3H]+ 5d is 20%, whereas the abundance of the corresponding fragment ions of compounds 9 and 10 is <<1%. Since compounds 9 and 10 have two chlorine substituents in the phenyl ring with the -OSO3TCE group, the low relative abundance of fragment ion [ArOSO3H]+ suggests that the sulfate group of both compounds is less stable, possibly because of the comparatively high pKa value of the Ar-OH group . This observation is in agreement with the decreasing chemical stability of aryl sulfate monoesters with increasing acidity of the phenolic aryl group . The fragmentation pathway of the chlorinated biphenyl moiety appears to depend on the degree of chlorination but not the chlorine substitution pattern. For compound 5, the principal fragmentation pathways of the dichlorinated precursor ion 5h is shown in Scheme 1. Fragment ion 5h can produce the fragment ions 5l (m/z 173, 5%) and 5m (m/z 149, 10%) by releasing a neutral HCl or chloroethyne molecule. Precursor ion 5h can also sequentially lose neutral Cl2 and ethyne molecules to give the fragment ion 5o (m/z 113, 6%) via 5n (m/z 139, 30%). Alternatively, fragment ion 5o can be formed in the reverse order via 5k (m/z 183, 12%). For comparison the principal fragmentation pathway of the trichlorinated precursor ion 8a is shown in Scheme 3 (see Figure 5 for the mass spectrum of compound 8). There are two important fragment ions, 8c (m/z 147, 4%) and 8e (m/z 137, 10%), which are granddaughter ions of precursor ion 8a (m/z 243, 26%). Precursor ion 8a can lose one molecule of HCl to yield its daughter ion 8d (m/z 207, 10%), which subsequently produces the fragment ions 8c and 8e by releasing chloroethyne or Cl2. Similarly, precursor ion 8f (m/z 173, 38%), which is obtained by releasing one molecule of Cl2 from its parent ion 8a, can release HCl and ethyne to give daughter ions 8e or 8c, respectively. Finally, precursor ion 8a can form granddaughter ion 8c via two pathways. One is via daughter ion 8b (m/z 183, 10%) by sequentially releasing HCl and chloroethyne, the other is via daughter ion 8g (m/z 217, 4%) by sequential loss of Cl2 and ethyne. Principal EI-MS fragmentation pathways of phenylcyclopentadienyl cation 8a (m/z 243) formed from 2',3,5'-trichlorobiphenyl-4-yl ester 2,2,2-trichloroethyl ester 8. The fragmentation pattern resulting in the formation of 8a from the corresponding molecular ion is analogous to the pathways shown in Scheme 1. Overall, the chlorine substitution pattern has little-to-no effect on the fragmentation pathways, with the relative weak abundance of some fragment ions of compounds 9 and 10 being one exception. For example, the fragmentation pathways of homologous compounds (such as compounds 5, 6 and 7 with two and compounds 9 and 10 with four chlorine substituents) are very similarly. In contrast, the fragmentation pathways of TCE PCB sulfates diesters investigated become more complex with increasing degree of chlorination in the biphenyl rings (e.g., 5 vs. 8 as discussed above), which is mainly due to the more complex fragmentation of the biphenyl rings part of the TCE PCB sulfates diesters. Similarly, MeO-PCBs, such as 12 and 13, form the chlorinated phenylcyclopentadienyl cations by losing CO and free radical CH3. The fragmentation patterns of these MeO-PCB-derived phenylcyclopentadienyl cations are similar to the ones observed for the corresponding TCE PCB sulfate diesters and typically depend on the degree of chlorination. Electron impact MS fragmentation pathways of a series of PCB TCE sulfate diesters with different degrees of chlorination and substitution patterns were investigated. Representative and abundant fragment ions were formed by releasing CHCCl3, SO3, HCl2, CCl3 from the TCE moiety. While the respective fragmentation pathways were identical for all PCB TCE sulfate diesters investigated, the intensities of one fragment ion, [ArOSO3H]+, was significantly lower when two ortho chlorine atoms were present. The instability of this fragment ion is probably a result of the comparatively high acidity resulting from the two chlorine substituents. Loss of the TCE sulfate group, independent of the fragmentation pathway, ultimately resulted in the formation of chlorinated phenylcyclopentadienyl cations. These chlorinated phenylcyclopentadienyl cations in turn formed abundant fragment ions by losing Cl2, HCl, ethyne and chloroethyne in a degree of chlorination-dependent manner; however, the fragmentation of the phenylcyclopentadienyl cations was independent of the chlorine substitution pattern. Overall, the fragmentation of the phenylcyclopentadienyl cations of the PCB TCE sulfate diesters is comparable to the respective MeO-PCBs. A series of TCE PCB sulfate diesters 1–10 was synthesized by sulfation of lower chlorinated HO-PCBs with an excess of 2,2,2-trichloroethyl chlorosulfate  (1.1 equivalent) in the presence of 4-N,N'-dimethylaminolpyridine (DMAP, 1.5 equivalent) in anhydrous dichloromethane . The corresponding starting materials, including the methoxylated (MeO-)PCBs 11–13, were synthesized as described previously . The structures of all compounds were confirmed by NMR, IR and (HR or LR) MS and are shown in Figure 1. The GC-MS analysis was carried out using an Agilent 6890 N Series network gas chromatograph equipped with a 7683B series auto injector (Agilent Technologies, Santa Clara, CA, USA). The GC was interfaced with an Agilent 5975 inert series mass-selective detector (MSD) configured in electron impact (EI) mode. Chromatography was accomplished with a fused silica capillary HP-5 column (30.0 m × 250 μm × 0.25 μm, Agilent, Santa Clara, CA, USA). Helium (18.6 ml/min) was used as carrier gas. The oven temperature was ramped over a linear gradient from 50 to 280°C at 20°C/min, then held for 10 minutes at 280°C. The injector temperature, ion source temperature and interface temperature were 250°C, 230°C and 280°C, respectively. The comparatively low injector temperature was necessary to avoid decomposition on the PCB TCE sulfate esters. This research was supported by grants ES05605, ES012475 and ES013661 from the National Institute of Environmental Health Sciences, NIH. Contents of this manuscript are solely the reponsibility of the authors and do not necessarily represent the official views of the NIEHS/NIH. XL collected the GC-MS data, performed data analysis, and contributed to drafting the manuscript. HJL and LWR conceived of the study, participated in its design and contributed to drafting the manuscript. All authors read and approved the final manuscript.